Valves are dorsiventral. The dorsal margin is moderately arched, somewhat convex to nearly flat (or weakly concave in larger specimens) and subtly biundulate. 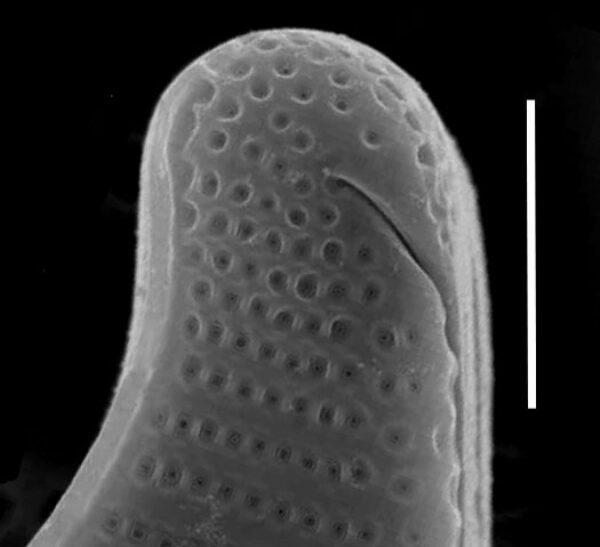 The ventral margin is weakly concave to nearly flat. Apices are rostrate, broadly rounded and distinctly set off from the high dorsal ‘shoulders’. Terminal raphe ends are positioned on the ventral margin, some distance from the apices. 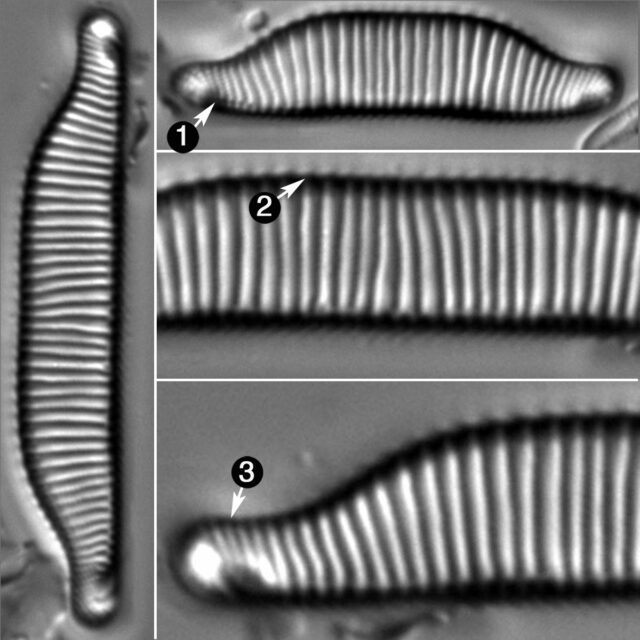 Striae are weakly radiate, composed of fine areolae and nearly evenly spaced, although an occasional short stria may be interspersed along the dorsal margin. 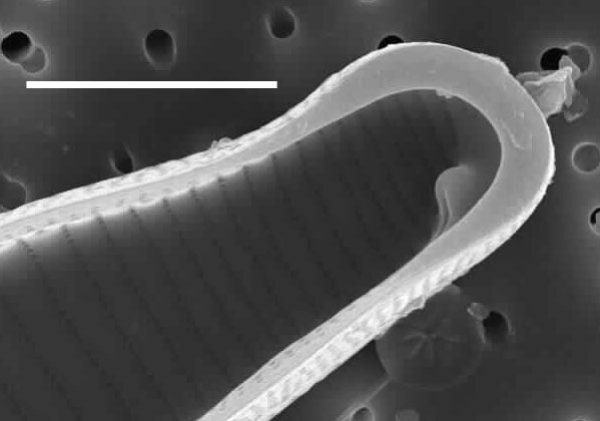 Under the SEM, the areolae can be seen to lie in separate depressions and number about 30 in 10 µm. Internally, the raphe fissure terminates in a raised helictoglossa. Patrick and Reimer (1966) report Eunotia sudetica from acid to circumneutral waters in Pennsylvania and the southeastern United States. Siver et al. (2005) report this species from two acidic ponds on Cape Cod, Massachusetts. Lange-Bertalot et al. (2011) report that E. sudetica prefers small, running waters or wet bryophyte habitats. 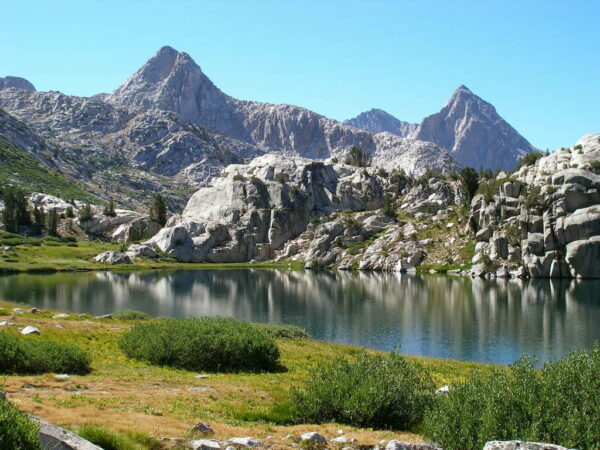 The one record of this species in the Montana Diatom Collection is from a lake high in the Sierra Nevada Mountains of California (photo below). In Europe, E. sudetica is found in waters with a pH optimum of 5.0, specific conductance under 100 µm and tannic waters with high concentrations of fulvic acids (Alles et al. 1991). It was reported to be in waters with slightly elevated sulfate and aluminum concentrations. Evolution Lake at an elevation of 3,313 m in the Sierra Nevada Range of central California, home of Eunotia sudetica. Müller, O. (1898) Bacillariales aus den Hochseen des Riesengebirges. Forschungsber. Biol. Stat. Plön 6: 1-40. Eunotia sudetica has somewhat convex, to nearly flat dorsal margins. The apices are rostrate, or nose-shaped, and helictoglossae lie some distance from the apices. Striae number 10-15 in 10 µm.